BEIJING/MBABANE (Reuters) - Taiwan's last diplomatic ally in Africa, the Kingdom of eSwatini, said on Wednesday it had no intention of switching ties to China, after a Chinese diplomat said he expected it to ditch Taipei soon amid a bitter diplomatic dispute. It lost its latest ally, El Salvador, on Tuesday, the third country to fall to China this year. Taiwan President Tsai Ing-wen has vowed to fight China's "increasingly out of control" behavior after the move. Ahead of a summit next month between China and African leaders in Beijing, China has been upping the pressure on Taiwan's last remaining ally on the continent, eSwatini, formerly known as Swaziland, to come over to China's side, diplomatic sources say. Briefing reporters in Beijing about the summit, Chinese Assistant Foreign Minister Chen Xiaodong said eSwatini did not have relations with China "for reasons that everyone knows". "We look forward to and hope that all African nations, with none left behind, can take part in positive China-Africa cooperation, and become a member of the largest family get together," Chen said. "I believe that this is not just the pursuit of China, it is also a widespread shared expectation of African nations. I believe that this target can, in the not too distant future, be realized," he added, without elaborating. "They must not play mind games because our relationship with Taiwan is over 50 years so we will not dump them," Mgwagwa said. "We have no desire to change camps since Taiwan has been good to us." Taiwan's foreign ministry referred Reuters to a comment from Foreign Minister Joseph Wu on Tuesday, when he said ties with eSwatini were "extremely firm". "We have to make mental preparations," Tsai said in a statement. "China's pressure toward Taiwan will not stop ahead of the elections." The island's biggest opposition party, the China-friendly Kuomintang (KMT), urged a "better alternative" following what it described as "enormous mistakes" in Tsai's policy toward China. "The ruling party has the responsibility to think of a better cross-strait policy ... Relations with China have turned stagnant and are frozen," KMT spokesman Mong-kai Hung told Reuters. 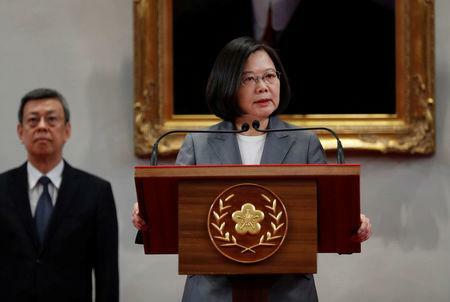 China's hostility to Taiwan has grown since Tsai's election as Beijing fears she wishes to push for the island's formal independence, a red line for China. She says she wants to maintain the status quo but will defend Taiwan's democracy.